We’re extremely proud and honored to boast that our museum complex is home to a 1932 Model “T” Sky Scout, built by Bernard H. Pietenpol. Known as the “Grandfather of the Experimental Aircraft”, Pietenpol was a native of Cherry Grove, Minnesota and a hometown hero. He became world famous for designing a home-built airplane powered by an automobile engine. He was a self-taught engineer who sold airplane building plans and built twenty planes himself. The Model “T” Sky Scout was added to our Pietenpol Collection at the History Center in 1990. On December 27, 2006, another of the late Bernard Pietenpol’s airplanes made its “final landing” in Fountain. This aircraft, an Air Camper, was built in 1947. Both Pietenpol aircraft can be viewed year round in an attached building of our main museum. Please check our our Pietenpol exhibit and mural in the main museum. 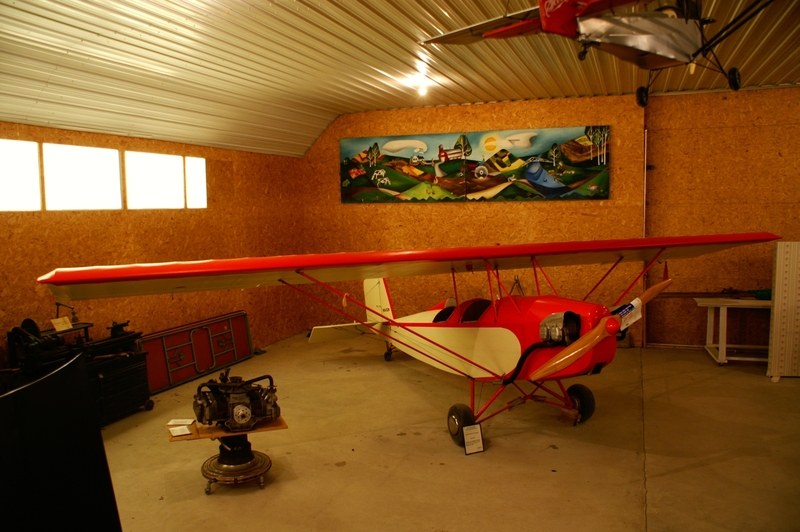 Located outdoors on our open air campus you’ll find an original Pietenpol Hangar.